The aviation industry remains a true behemoth in the economic world, as it continues to grow at an incredible rate year-over-year. In fact, it experienced something of a golden age between 2009 and 2014, when the industry grew at a compound annual growth rate of around 9.5% before reaching a cumulative value of $751 billion. While the industry experienced a brief decline between 2015 and 2016, it enjoyed a stellar 2017 and is set to achieved record peak commercial revenues of $824 billion by the end of this year. Much of this growth is based on sustained demand, as consumer spending continues to increase across the globe. Similarly, the market has also thrived on the back of innovation and new data analysis technologies, which have helped brands to enhance the customer experience, personalize discounts and create safer aircraft for travelling. 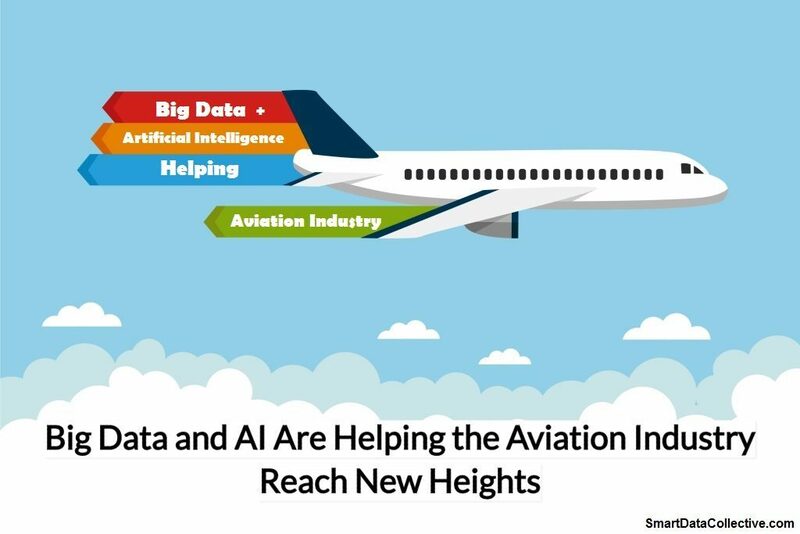 Big data and AI are already powering exciting innovations in the aviation industry. In this post we’ll look at how they will become even more influential in 2018, across a broad range of industries. What’s powering the big data collection and analysis boom? It’s well understood that big data can help businesses gain a competitive advantage, but aviation firms have been a little slower to embrace this trend. Sure, many airlines have focused on accumulating large data sets to improve the consumer experience and create targeted discounts, but most are just scratching the service when it comes to potential applications. Much of existing data infrastructure has been bottlenecked by hardware limitations. However, this is changing, thanks to evolutions in powering more and more complex hardware. There have been many advances in how data tech uses power, making server infrastructure more power efficient. But just as hardware becomes more efficient, more and more is demanded of it by data scientists. Thankfully, the technology that underpins the power supply market continues to advance. After all, airlines require large-scale servers and hardware to collate, store and analyze vast data sets, and companies are beginning to invest in solutions that can handle such demands. As data scientists in a large number of industries continue to daisy-chain GPUs and CPUs that power modern AI, advances in DC-DC technology is playing a pivotal role in this evolution, with firms such as XP Power currently supplying the best and most cutting edge converters to help increase server capacity and performance. By increasing the amount of power available to critical components, more can be asked of them. This will enable airlines to utilize larger stores of big data more effectively, particularly in terms of personalized communications and tailoring services to meet individual needs. More specifically, we’ll see more schemes like BA’s ‘Know Me’ initiative emerge, laying the foundation for superior service, rewarded by improvements in customer loyalty. And the best part is this can all be accomplished with fewer servers – high-powered technology entering the market is becoming more efficient and capable. The same principle can be applied to AI, as airlines continue to invest heavily in research and development in order to realize the true potential of this technology. Planes already leverage basic AI capabilities to drive its GPS navigation software. For example, the computer is able to perceive location and provide actionable directions. As hardware evolves, we’ll see GPS systems that not only handle complex logistical challenges, but network together to provide better routing – similar to Waze’s smartphone GPS. Another emerging application of AI revolves around passenger comfort and safety, with a number of systems having recently been developed to support an optimal, automated aircraft cabin pressure. This technology will be developed further in the future, as airlines look to protect customer interests and enhance their experience. The Fusion of Big Data and AI? Perhaps the biggest future trend focuses on the fusion of AI and big data, with the former able to utilize the latter through the application of transformative algorithms. These are deep learning architectures that enables computers to identify positive patterns in data and trigger direct actions, and this type of advanced technology will form the foundation of second generation AI in the future. No matter whether you focus on hardware, software or the data scientists that make it all possible, the future impact of AI on complex industries will be substantial. With great power comes great responsibility. We’ll have to wait and see how different companies out-innovate each other. And hopefully the warnings about AI won’t come to pass – especially when coupled with machine learning.